Our priorities for cash flow are reducing debt and paying dividends, followed by a balance of share buybacks and capital investment. 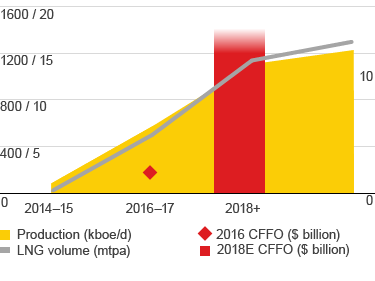 Shell’s dividend distributed in 2016 was $15 billion. Our dividend policy is to grow the US dollar dividend through time, in line with our view of Shell’s underlying earnings and cash flow. When setting the dividend, the Board looks at a range of factors, including the macroeconomic environment, the current balance sheet and future investment plans. 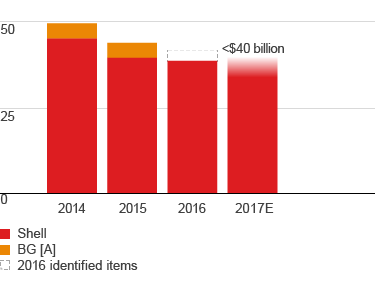 We see potential for at least $25 billion of buybacks in the period 2017-2020, subject to debt reduction and recovery in oil prices. 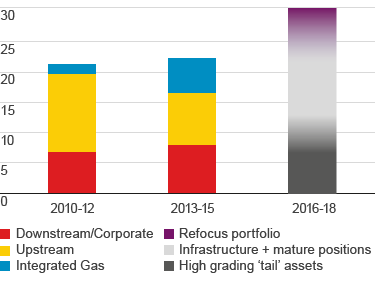 We have identified four levers to manage through the market down-cycle: divestments, reduced capital investment and operating expenses, and delivering new projects that will add significant cash flow. [A] Historical BG capital investment based on BG's published Annual Reports. [A] Historical BG operating expenses based on BG's published Annual Reports. 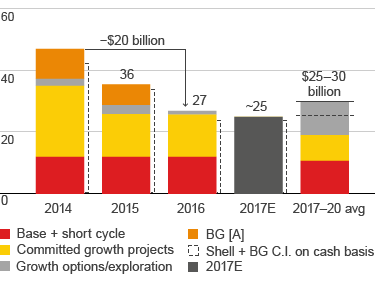 [A] BG organic growth from January 1, 2016; LNG volume includes offtake; 2016 $60 oil price scenario 2018 (real terms).